My 3-year-old preschooler loves any and all things to match: these cute fall match cards, plastic spoons (see the picture towards the bottom of the post), and even matching a set of coins. 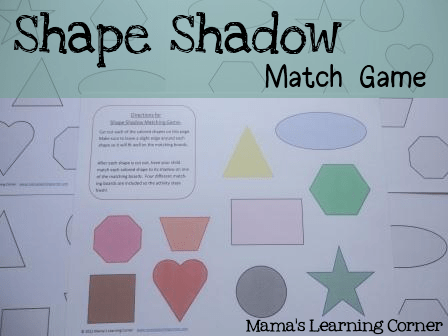 So of course she loved this new Shape Shadow Match Game I made for her this week. Included in this download is a page of colored shapes and a set of 4 black & white Game Boards. After downloading and printing the game on cardstock, cut out the colored shapes only. Leave the black & white game boards intact. Your child can then match the colored shapes to the Game Boards. I included 4 Game Boards so the activity would stay fresh for a longer period of time. We know how quickly toddlers/preschoolers become bored using the same Game Board over and over!